Well it has now been 15 days since my little prince has been sick. 15 days since I have gotten out of the house other then to go to the hospital, grocery store, or school meetings. 15 days is a long time to be cooped up and an even longer time to be sick! Mr 10 is still a pretty sick little man. His healing has been slow but steady. He has not regained much appetite. I am trying to get him to eat little bits all day long, offering him Carnation Instant Breakfast, and shoving liquid at him whenever he is not attempting to eat something. I have threatened him with a feeding tube....yes that is how bad it is....and wishing each night that I really did have a way just to pump some food into him while he sleeps! He was spiking pretty high fevers with the IV antibiotics up until today and I think we had our first fever free 24 hours as of this evening! He is also having lots of pain in his stomach where the drain was which is causing him to still require some pretty strong pain killers a couple times a day. I am happy to report however that we have managed to not get a ticket back to the hospital. We have been able to manage everything here at home and will return to the clinic on Tuesday to draw blood to check Mr. 10's CBC and determine whether or not the IV antibiotics can be discontinued. Please continue to play for healing! Makenzie has been doing super! She has been such a trooper! She did great at the hospital and even learned how to sleep through loud nurses in the middle of the night. She also showed me that she can fall asleep in a room that is not completely silent! This may not seem like much but for Makenzie is is HUGE! Makenzie also got to play with a talker last week while her speech therapist was here. I programed a user for Makenzie on the computer and had it ready to load when the therapist walked through the door. I can't wait for Makenzie to get her very own! This week in PT Makenzie did a GREAT job of maintaining all fours with her head up, looking from side to side! She has been so loose and happy! Her giggles are contagious and everyone that we ran into at the hospital was so impressed with how healthy Makenzie was and how well she was doing! God is so good! I am praying that this week brings healing. I pray that Mr. 10's appetite and energy level will return. I am also praying that the infection in his gut is gone! We are home. It is bitter sweet as my poor boy is still fighting a raging infection. He still feels pretty dang horrible. This afternoon they pulled out the drain that was in his gut about 1 pm and we were on our way. Mr. 10 has still been spiking fevers but his white blood count is only slightly elevated telling us that the antibiotics are doing their job and they felt comfortable letting him come home. Now we need to get him up and walking and eating more so that his bowels will start to improve. This evening the home health care delivered IV medication and our nurse came by to teach me how to administer the meds. After she left he spiked another fever so I gave him some Motrin and he is fast asleep. I have so much more to say about the last 2 days but quite frankly I am too tired. Please, Please say a prayer of healing for Mr 10! He really is still very sick and has a long road ahead of him including another surgery to remove his appendix. He is miserable. I am tired and scared for him. Please pray that he will wake up in the morning feeling much better and that the bacteria in his body is killed off quickly! Today was a long day. I was not a bad day... just long. At this point I guess really .... it was really yesterday that was long. Mr.10 was finally taken down to CT and IR to have a drain placed in the abscess that was formed after his appendix ruptured and a PICC line put in at one this afternoon. He was very scared and it took everything that I had to hold back the tears and be strong while my little boy laid on the table and cried himself to sleep. It took about an hour to get the drain and PICC line in. When I went back to the PACU to see him, he was still pretty out of it but woke up enough to say hi and let me give him a big kiss and a stuffed animal. Shortly after he spiked a fever of about 102 so we left the PACU and headed back to his room for some fever reducers. It took him about 2 hours to fully wake up. His hearth rate was high, his respirations were high, his blood pressure was really high, and his oxygen level were low. A little blow by oxygen fixed the low level and some pain killer and Tylenol helped with the rest. Mr 10 perked up a bit when his grandma Linda showed up to see him. She brought him a bag with lots of fun things to do and snacks to eat...... when he can eat again. The have drained about one and a half ounces of infected fluid out of his gut so far. The drain will stay in until it stop draining and we will be here until that happens. The antibiotics are working as his fever did not return until about 3am and it was much lower then this afternoon. However, his bowel sounds when from quiet to non existent. I guess this is normal as his body fights off this infection. Until his colon begins to work again Mr 10 can not eat because that would put him at risk for perforating his bowel. He is also requiring some blow by oxygen again this evening/morning. So that is were we stand. Mr. 10 and Makenzie are both sound asleep. If I don't get back to sleep I am going to watch the sun rise and while that is a pretty site over the mountains I want to have my eyes shut for the show this morning! Tonight I was supposed to be getting rained on at a Sugarland concert with Makenzie and several of my friends. Instead, tonight I am sitting in a dark, noisy hospital room with my son,,,, and Makenzie. Mr 10 has been super sick for the last 7 days. I took him to the emergency room on Monday and was sent home with nothing more then an expensive bottle of power aid and the notion that he just had a simple stomach virus even though his belly hurt to the touch, he had a fever, he had no energy, had loose stools, and was vomiting and had been for four days. On Tuesday he stopped vomiting and seemed to have a bit more energy but was still obviously sick. This continued into Wednesday and by Thursday I could have cared less that this "stomach bug" should supposedly last for 10-12 days. I called GI to make an urgent appointment and the soonest I was told the could get him in was on Tuesday. Well that just wasn't going to fly with this momma so I made some calls and by the end of the day we were scheduled to see the GI doctor this morning at 8:30am. The funny,..... or not so funny.... thing is, I asked the ER doctors 3 times if they should or would do any further testing for an appendicitis in the ER. Three times I was told no. He presented all of the signs and had a mother who told them how dang sick is was and nothing. So here I sit. Waiting for 10 am to roll around. Waiting for the surgeons to put a drain into the 6 in abscess that is sitting in my sons abdominal cavity. Waiting to place a PICC line so that Mr 10 can have a 3-5 week course of IV antibiotics. Just waiting. At the end of the day we are all human. We all make mistakes. God's grace covered human error and allowed my sons body to form an barrier around the perforation, keeping his body from becoming septic. This barrier allowed my son to live regardless of a very serious mis diagnosis. This barrier is a miracle. So tonight I am sad that I missed out on a good time with my daughter and my close friends but....... I am right where I need to be. Makenzie is sleeping soundly on the window seat/bed and I am now going to go curl up next to her and try to get some rest! Please pray for my sons speedy recovery! I have been so busy. It has gotten to the point where I am having a hard time organizing my thoughts into to put a post together. Friday Mr. 10 got sick with what appeared to be a stomach bug. By Monday when he had spent over 24 hours on the couch sleeping and numerous calls to the pediatrician I decided a trip to the ER was in order. Quite honestly I have never seen any of my kids so sick and before we jumped in the car I packed a bag because I was sure we would not be returning home that day. The ER doc did an evaluation, gave Mr. 10 a bottle of power-aid, listened to his bowel sounds and sent us home with a diagnosis of Severe Gastroenteritis. I took a deep breath. However yesterday Mr. 10 continued to complain of severe pain in his stomach as well as having high fevers on and off and I got to worrying again. I called the pediatrician again this morning. WE discussed my son's medical history and advised me to call the GI doctor for an urgent appointment. I called two offices and both thought the definition of urgent was next Tuesday. When I asked what I should do with my completely miserable child that is supposed to head back to school on Monday and who has not eaten much but toast for 7 days now, their response was that I could take him to the pediatrician or the ER. However the ER is out because I can not afford another $150.00 bottle of power aid. So again I call the pediatrician and I am waiting to hear from the doctor to see if he can work any magic to get Mr. 10 in to see a GI specialist...... today! Crossing my fingers. As for Makenzie she is doing AMAZING! We are still working on getting her into school which continues to be a struggle. The staff at the school has been great but communication has been less then adequate causing scheduling issues and delayed resolution of several issues. It is also very clear to me at this point that speech goals and the lack of a talker at the current time are going to be major hurdles. Makenzie and I are going into the school this afternoon for a "Communication Evaluation"...... without a way for Makenzie to communicate. Makes sense right? I understand that they can asses receptive language to a point but really to cut to the chase I believe that they understand that there is no formal testing they can do with Makenzie to access her needs other then interaction and observation. However, in the interest of cooperation we will be showing up for our appointment armed with the six page report Makenzie's speech therapist wrote up after her most recent Augmentative Communication Evaluation. So much more is going on in our lives right now and I have so much to say however I have a sick kid, more phone calls to make, Makenzie has PT, Hippo therapy, the evaluation at the school, and a meeting with the seating guy going on yet today! So...... Have a Happy Thursday and I will be back soon. School is coming. Summer is long but I am pretty sure that the last few weeks before school begins feel like they drag on and on and on. The boys are restless. We have done all of the fun activities I could come up with and this mommy is exhausted. I have decided to try sending Makenzie to school again this year. We have a new school and the possibility for a more experienced team and a fresh set of ideas. However the process of getting everything that Makenzie needs organized is frustrating to say the least. Last Thursday Makenzie and I had a really great meeting with the principal at the new school. It went great. We discussed all of the major points and I felt fairly comfortable with everything that was said and how they thought Makenzie could be integrated at the school. I left with a skip in my step and a heart which felt full. For a brief moment I forgot about all of the school related problems we have had in the last 3 years. For a moment I thought about Makenzie having new friends, using her talker to communicate, driving her power chair up and down the hallways, and walking around in her walker on the playground playing with her peers. I was so excited because last year at this time Makenzie was not able to do any of those things. I was so excited about her healing over the last year and how much more she would be able to do and learn at school. Then reality hit me. After a response to a summery I sent of my notes from our meeting, I realized that while this principal is great and the ILC programed sounds wonderful I am still going to have to fight the same battles, cut the same political red tape, and run in some of the same circles I have found myself running in for the last 3 years. However, circles I will run. This year I am finding myself a lot less emotional. I am feeling much more prepared to fight this fight in a more matter of fact manner. This year Makenzie will go to school. She will have access to a talker. She will have a staff that is properly trained on what is needed to allow Makenzie to have a free and appropriate education. I have printed out the special education laws and have read through them for hours. I have researched the best way to document meetings and other contact with school staff, I have contacted both legal and advocacy companies, and I am prepared for mediation and due process if need be. I would prefer not to have to take that route. I am trying really hard to play nice and go with the flow. I been very patient thus far and am trying to be optimistic about the outcome. I guess only time will tell. Pray for everything to work out. Pray that this staff will make this process about Makenzie and not anything else. Makenzie and I have had a great couple of days. The boys have been with their grandma for the weekend and it has been very quiet around here. In fact it has been too quiet for Makenzie. I had a bunch of things that needed to get done but none of it happened because Makenzie has been super clingy and has needed so much attention. She has wanted to be busy. Even when I am holding her sitting on the couch is not enough. We have to DO something. If I lay her down she starts crying big alligator tears before I can even stand up and gosh forbid I walk out of the room. At one point yesterday she began to cry. I laid down next to her and asked her if you missed her brothers. She went from extension and crocodile tears to kicking her legs, a smile, and then uncontrollable laughter. Oh my! Having less kids around was supposed to be a break for this mommy but instead I turned into the noise and entertainment while they were gone! Yesterday we headed out to the park with Makenzie's walker, extra clothes, and a towel to play in the water fountains. We had so much fun! Makenzie walked all over the place and the water made her laugh so hard. To top off the day Makenzie grew up a bit more yesterday when she lost her very first tooth! It is now time to officially begin the day! Have a great Sunday! I have seen a few posts lately titled something like... things you need to know about special needs families..... so I thought I would play along. 1. Not many things my special needs child NEEDS can be bought at Wal-Mart. Walkers, wheelchairs, braces, bolsters, wedges, feeding pumps and bags, adapted toys, switches, trays, formula, shoes, and the list goes on. Have you ever had to run to the store in the middle of the night to grab a can of formula for your hungry baby? Maybe you can't find your child's bottle so it is off to pick up another one. How about when your baby begins to develop into a toddler and his legs are strong enough to bear weight? Off to the store you go to buy a cute little push toy with all kinds of fun buttons and noises. Maybe the summer has come and you head to the park without thinking about how amazing it is that there a swing your child can enjoy. One of the most frustrating things I have found about raising Makenzie over the last 4 years is the inability to be able to provide her with the things she needs and likes with any kind of quickness. Most of the things Makenzie needs can not be bought at a local store and everything has to be well planed out. On top of that is the insurance company who has the authority to decide if certain things are truly needs without having ever met my daughter. Of course there are things that insurance won't pay for and most of the time those are things that only Donald Trump could afford. It seems like providing Makenzie many of the simple necessities in life always involve waiting, crying, phone calls, and fighting with some one. The difference in cost on typical childhood equipment and anything modified for special needs child is staggering! SO Frustrating! 2. Mommy always know best. This obviously applies to all moms but takes on a new meaning when you have a child with special needs. There are many people who have input in my child's. 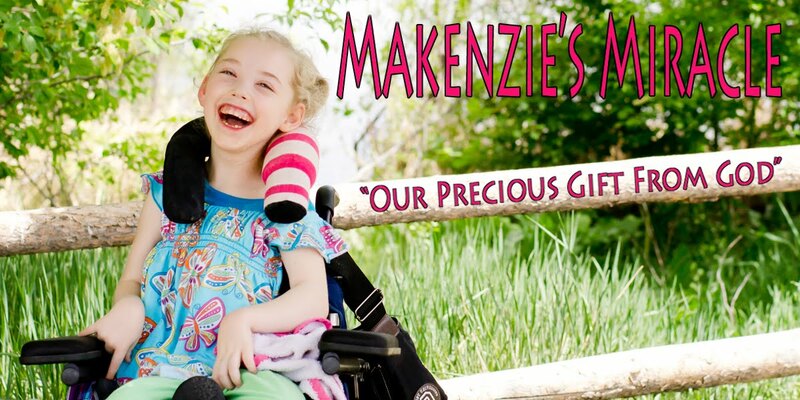 Makenzie has a whole team of doctors, therapists, and teachers who want to help. There are care conferences, reports, health plans, and education plans which document and justify almost everything about Makenzie's existence. I have been very lucky to have a team who understands when push comes to shove.... Mommy knows best. The one area where I have had trouble getting professionals to understand this is the school system. However, I am working very hard this year to get them to listen to me and understand that although I may not have a masters in Special Education I an equal part of the team which makes decisions for Makenzie. I am trying to remove the emotion and make this a business matter where the winner is Makenzie! 3. The day when you can scold your child with special needs could not come soon enough! There was a time in Makenzie's life when I thought she would never misbehave again. There was a long time when we knew that she had no control over her actions and reactions. That time is over and I am beyond excited about it! Of course Makenzie does not act out in the way most of us would imagine a 6 year old to. However, there are many things that Makenzie can control like lifting her head up, pushing with her arms, sitting down into her chair without extending, following directions, and paying attention to what is going on around her. At this point in Makenzie's life not only can she control these things but she can do them when asked. When you put the too of those things together you now have a child with free will. To add icing to the cake, Makenzie now understands the threat of stopping an activity if she will not follow a request. For example, today when Makenzie was in her walker she would not keep her head up. She insisted on flexing and was being super stubborn. I looked my daughter in the eyes and told her that if she would not lift her head up that she was going to have to get out of her walker. Makenzie looked at me and got a huge pouty face. I repeated myself and up went Makenzie's head and off she went. Loving it!!!! 4. As a mother of a special needs child I see every accomplishment, no matter how small, as a miracle. When all of mt kids were little they learned to smile, laugh, roll, sit, crawl, walk, and potty train and I celebrated. At the same time I took most of those milestones for granted. After Makenzie's accident taking those things for granted is a thing of the past. To this day I still get butterflies in my stomach and my heart swells to see my children smile, to hear them laugh, and I see every little new movement they makes. Yesterday we trialed one last talker. Watching Makenzie be able to find her voice, play games, and pick music on the talker made my heart feel like it was going to explode. What a miracle life is! 5. Being a parent of a special needs child comes with very high highs and very low lows. Yesterday morning when I woke up at 3:30am on the couch I realized that I had fallen asleep watching a movie with the boys. I got up, made Makenzie's water, dosed her medicine, started it, and I was wide awake. I hopped on the computer. Looked at a few sites, popped in my memory stick and looked at a few pictures. I ended my computer session in tears feeling helpless to provide Makenzie the things that she needed. (see number 1) I laid back down on the couch but my mind would not turn of. I watched the sun come up and about 6:30am I finally gave up and got up for the day with a grand three and a half of sleep to get me through the day. It was a low low! However, I ended the day on a high high. Watching Makenzie use the talker so successfully my my tired body and mind feel alive again. I listened as the DynaVox reps eeewed and aaaahed about how well she was able to access the device. Then I headed to the school and had a very successful meeting with the principal and the district. In fact it was the best one ever to date. I spent time preparing my thoughts and got most of the answers I wanted. I was also able to express Makenzie's needs without compromise but with a great sense of calm authority. More importantly the principal was GREAT!!! He was kind and patient. He took two hours to speak with me and never once appeared frustrated or anxious. He showed Makenzie and I around the school and acted very excited to have Makenzie at his school. From the sound of it this program is a hundred times better then the one at the old school and the aides sound amazing. There is still much to talk about and work out but I could not be happier! High highs! Some days I feel like I live on a roller coaster. There are times when I just want to jump off but quickly the tide changes and I feel life could not get any better. Times when I can clearly see and understand God's mighty hand working in my life. Anything else you would just love to know? Makenzie's Taos walker came in at the end of last week. Today it was finally ready to use. She loved it. I think it is a great walker for Makenzie. There are a few issues I have but hopefully we will be able to come up with some ways to fix those issues. My biggest issue I have with pretty much every walker we had tried is the lack of upper trunk support. Makenzie can stand up straight and she can walk with her head up. However, she also flexes a lot in the walker. I am pretty sure this frustrates me more then it does Makenzie because she will bend down and just giggle. Mommy doesn't think it is funny! I think adjusting the trunk support will be helpful. I was looking at some of the videos that the company who makes this walker has put out. Pretty much every single kiddo has the top trunk support right under the armpits. If you look at Makenzie this support is much much lower. We may also need something that will hold Makenzie's shoulders up. She works really hard and sometimes that is ok but sometimes I would love for her to just be able to enjoy walking and playing while letting something else hold her up. Today is going to be a super busy day. Makenzie has back to back appointments from 8am to about 3 pm. Pray that this mommy can keep up with all of this busyness! Well it is now August. That means summer is almost over and this little family will begin to switch gears in an attempt to get back on a schedule that involves a BEDTIME!!! We are not done with summer fun. I mean who could end summer without a snow cone or 2 or 5. Yeah five snow cones in less then two hours! Mr 10's goal was to try one of every flavor before we left a really cool event hosted by the Starlight Foundation on Saturday. Makenzie enjoyed some snow cone as well and just being outside in the summer sun! However, these will be the last good pictures I will be taking for about 4-6 weeks. While I was putting Makenzie's wheelchair into the van this weekend I forgot to zip up her backpack with my camera inside. Needless to say my camera hit the ground pretty hard and had to be sent in for repairs. I am really bummed but I am pretty sure my children will enjoy not having to hide from me for awhile! I do have a point and shoot that I can use. I took some pictures this weekend at my cousin's baby shower and was very disappointed at how they turned out! I bet I won't drop my camera again anytime soon! The beginning of August also means the beginning of calls to the school's, IEP meetings, school shopping, a trip to the eye doctor, haircuts, new shoes, school orientation and a few new pieces of clothing for each of the kids. I think I am going to try the school thing again with Makenzie. We are within the boundaries for a different school and am going to meet with the principal on Thursday. I have written up a list of most of my expectations. It is a long list. I am hoping to go into the meeting with my thoughts and Makenzie's needs organized. I would like to go over the list with the principal and discuss each point, get input, then try and come to a good compromise which will keep Makenzie safe, allow her to learn, and give this mommy peace. Makenzie's Taos Walker also came in this week and will completely ready for her to use tomorrow morning. We had a sneak peek last night and Makenzie walked really well. Makenzie was very patient while the orthopaedist adjusted everything to fit her. He took the base with him to finish the shoes, extend the top bars, and bring in the width a bit. He will be bringing it back first thing in the morning. We also go approval for the Kidwalk and a bath chair! Now we wait on insurance approval for the talker, power chair, and car seat. August is in full swing! I'm not sure I am ready! Are you?